William Shatner is one of the greatest Canadian exports of all time, a full-fledged North American treasure. He is also a man who is unafraid to stay on topic, so if you’d like to get him to open up, it’s best to stick to things predominantly to matters related to current projects. Popdose was offered the opportunity to spend 10 minutes on the phone with the individual some call the Shatman, and we snapped it up giddily, but don’t dive in with expectations of an in-depth interview about his life and times. In truth, the most in-depth we got in our conversation came when discussing how much we both enjoy the adrenaline rush of getting a good story during an interview. Still, we did talk about his latest documentary project, The Captains Close Up (a.k.a the reason we were chatting in the first place), what other docs he’s got in the pipeline, what musician he’s collaborating with on his next album, and if there’s a chance we might actually get to see him acting again anytime soon. That’s quite all right. I appreciate you making time for me at all. Oh, well, my appreciation is for you being willing to talk to me. That’s great. The Captains Close Up! It’s a deep, heartfelt insight into these human beings who played the captains on Star Trek. It’s totally different from the documentary called The Captains. 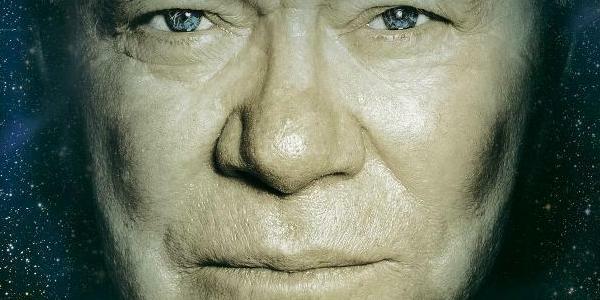 The Captains Close Up is an intimate portrait of the person and their lives. Which is important to clarify, because from the title, the first instinct is to say, “Oh, well, this is some sort of expanded version of The Captains.” But it’s not. It’s almost entirely different. It’s a portrait of a human being in many areas where they have never spoken of before. Now, were these interviews done at the same time as The Captains, or were they done in the wake of that film? No, basically, they were done at the same time. But I was able to get into depth with them that we had no time for in The Captains. I wanted to, but the documentary had to march on. Whereas here we could lovingly show them as the human beings they are and listen to them speak about their life and their sacrifices as well as their triumphs. When you’re discussing an actor’s career with them, given that the two of you have a shared profession, do you find yourself shifting between the roles of interviewer and fellow actor? Well, I’ve done a lot of interviewing. I had an interview show on the air for three seasons called Raw Nerve, and I did 39 interviews with various people, sometimes more than one on the same day. Like, I had Rush Limbaugh and Larry Flynt, Rush in the morning and Larry in the afternoon. I had them both weeping on camera from the material that they were talking about. That sort of thing, I seem to have a gift for. I mean, the interviewing. And so my curiosity about the soul of somebody takes place, and I was able to do that with Patrick (Stewart) and Avery (Brooks) and Scott (Bakula) and Kate (Mulgrew). I didn’t have enough time with Chris Pine, but I would’ve liked to have. When you’re discussing their careers with them, do you have an inherent sense of how far to push with talking about certain topics? Well, you know, that’s a good question. I’m their peer, I know them—at that time not well, but I’m acquainted with them—and I’m operating at the same level that they are. They know that I’m not going to hurt them. You know, with a lot of interviewers, they want sensational material, and they’re willing to try and get it that one time. I’m not going to hurt them. I’m going to ask questions, but not questions that are hurtful. Merely…well, I shouldn’t use the word “merely,” but they’re questions of depth that require them to look into their souls. And if they wish to answer, they answer. And in these cases, they answered them. Did you give them discussion topics in advance, or was it all spontaneous? No, no, no. Just ambling along and taking…y’know, when you’re able to see the people and speak to them with your face fairly close, like an intimate conversation, the non-verbal language that comes off the face—as you well know—is equally important as the words they speak. Was there a particular interview of the bunch that went in a direction that particularly surprised you? All of them did. When I began to sing with Avery Brooks and reaching to him through words and music, where he felt most comfortable, that was a surprise. When Patrick Stewart talked about his mother and abuse, that was surprising. When Kate Mulgrew talked about the sacrifice with her children and work, another surprise. Scott Bakula started talking about divorce and the sacrifices he made in his marriage. It was extraordinary. Have you contemplated doing further interviews with other Trek cast members? The Non-Captains, as it were? No, I think I’ve mined that field. [Laughs.] I’m editing right now an extraordinary look at the first two years of Star Trek: The Next Generation. Something unusual, if not unique, happened during the production of those two years on that series, until it found its legs in the third years and went on for seven. But the first two years, it was chaotic. I’m calling the documentary Wacky-Doodle, because everything went wacky doodle, and I’m editing it right now, as I say, and it’s going to be highly unusual. Other things, other documentaries that we’re making… I’m in the process of selling a reality show based on who goes to conventions. Not just science-fiction conventions and Comic-Con, but asking who goes to all these weird conventions, and coming up with some answers. So I’m enjoying making these documentaries, in that they’re a source of discovery in the same way when you conduct an interview and you suddenly find out something that you didn’t know before. It must be the same feeling as finding a nugget of gold. There’s an exultant thing about it. Oh, I love it. It’s fantastic. Beyond Popdose, I contribute to a feature on the Onion AV Club called Random Roles, where I just try to do the deepest research possible and then ask them about various parts they’ve played in their career. It’s like word association. You just see what happens when they hear you bring it up. It’s a beautiful thing when you mention something that hasn’t come up in an interview for three decades, and they’ve suddenly got a story to tell that they haven’t thought about since they actually did the project. Oh, absolutely. I’m doing a podcast…I’ve done 36 of them now, five to ten minutes each…in which I use wine as a means of inserting the conversation (“Brown Bag Wine Tasting”). So they’ll sip a glass of wine, I’ll ask them to comment on how the wine tastes from whatever their profession is, from the aspect of their profession. So I’ve found myself asking Dave Koz, the great saxophonist, to play on the saxophone what he thought the wine tastes like. So it’s a wine interview which is totally musical. That sort of thing can happen if you use a device that jars the set-piece of their mind, and suddenly they’re careening down a conversational path that they hadn’t expected. Given that you’re spending most of your time as a documentarian these days, do you foresee a return to music anytime soon? I’ve got an album coming out in October called Ponder the Mystery. I wrote the lyrics, and Billy Sherwood of Yes wrote the music. He’s an extraordinarily talented man. And we’ve got something very unusual. That’ll drop in October. I’m writing a book, I’m on tour with a one-man show called Shatner’s World, and we’ve got a fantasy that the album will be sufficiently good for me to go out with a band, with a group and myself, to some limited engagements to play that music. Nice. Now, I can’t recall: was Billy Sherwood on Seeking Major Tom, or is this your first collaboration with him? With all due respect to Mr. Sherwood, do you foresee collaborating with Ben again? I’d love to. He’s become a buddy. But I guess you can only go to the well so many times. [Laughs.] But Billy Sherwood is extraordinary. I had a great time with him. I hope you’ll agree when you hear the record. So is there any actual acting coming up in the near future? Well, yes, there’s films and…I may go back to television. I’m doing a lot of appearances and speaking engagements, and that’s fun, but I may go back to doing an episodic series. In fact, after our interview, I’m going to go meet about that. Lastly, did you enjoy the challenge of doing the live Hot in Cleveland episode? Yeah! Wasn’t that something? You know, I’ve been in front of audiences all my life, so opening night is opening night: there’s an excitement about it. But when you think of the millions of people that are watching, and some of the, uh, older people in the cast… [Starts to laugh.] …have difficulty remembering lines. But it was fun. It was exhilarating!